This image shows an impact debris cloud on Jupiter, several days after the planet was hit by a comet or asteroid. The dark cloud was filled with cindery bits of debris after the object that impacted Jupiter exploded like 2000 megatons of TNT. The high infrared brightness in reflected sunlight measured during follow up observations confirmed that the cloud was black dust resulting from the impact of a comet or asteroid. 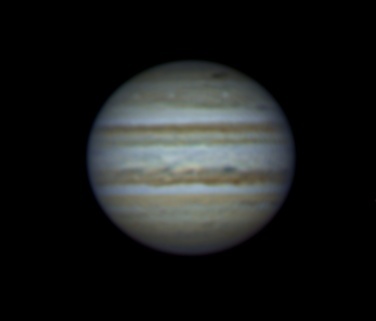 The winds on Jupiter spread the debris and enlarged the dark cloud. This image was taken on July 31. 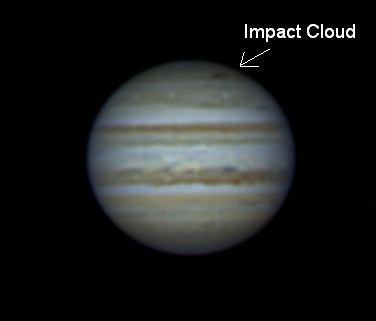 The impact cloud was discovered on July 19 by amateur astronomer Anthony Wesley in Australia. Comet Shoemaker-Levy 9, which was discovered by David H. Levy, Gene Shoemaker and Carolyn Shoemaker, similarly impacted Jupiter in July 1994, leaving dark clouds at the impact spots. Because Jupiter is a gas giant, asteroids and comets leave dark clouds when they impact the planet. When a comet or asteroid hits a terrestrial planet like the Earth, it leaves an impact crater like those on the Moon. The impact on Jupiter in 1994 of Comet Shoemaker-Levy 9, and this impact in 2009, are both reminders that comets and asteroids still impact planets even today. The image was taken with the RCOS 24-inch telescope at the University of Arizona SkyCenter on Mt. Lemmon, Arizona, using a web cam and 2x barlow operated by Adam Block. Adam conducts a nightly observing program open to the public at the Mount Lemmon SkyCenter with this telescope. For more information concerning the observing program, contact Adam Block. RA: 21h 46m 15s Dec: -14d 32' 40"